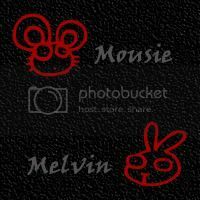 Welcome to the Mind o'Mousie, home of Mousie the Webbe-Mistress & my head bunny mascot, Melvin! You're definitely gonna love it here! Thanks to everyone for their help! We appreciate it! 12/4/2007: Happy holidays, everybody! We have all new stuff for you everywhere... New items at the IMVU store, the Cafe Press Store, and here on our website.... And more's to come! What a busy last couple of months it's been... The friendly folks at Angelfire and I had a little bit of an issue over exactly when my credit card expires, so it's been kind of impossible to actually edit the Mind O' Mousie for a while... That's okay, though, because everything's resolved now, and we're back and better than ever! We posted a fabulous featured artist for you this month... hopefully it'll make up for having Ms. Blake- wonderful as she is- stuck as the featured artist fot the past two months. We have new featured artists slated for you through February, and one pending for March that we're waiting to hear from. So you won't have to worry about getting your monthly fix for quite a while. We're going to be doing some general maintenance and cleaning for you over this month, so happy holidays! The site's gonna get decked out for you, so don't forget to check back with us from time to time! 3/26/2008: Hey there! I know it's been a long long long time since we updated anything around here (try before Christmas *wince*). I'm terribly, horribly, awfully sorry. It's entirely my fault. A lot of you have been emailing Melvin and begging him for news, and the poor little guy just hasn't had any to give! Well, not to worry! I have news, brand-spanking-new and hot off the press. Melvin is going to have his VERY. OWN. SITE. That's right, the little head bunny shall have his very own site, just to assuage his fans (who are starting to look like an angry mob since I haven't updated nearly as much as I planned). This is one of the huge projects that have been keeping me extremely busy. I'm also well into the conception and creation of the Dead Pleasures Spring/Summer '08 line for IMVU.com. So never fear- new products are on the way! Also, I'm working on a new conceptual design for our current website. It should make everything load faster, look more professional, and have easier (and more consistent!) navigation. So you see? I really do love you, and no matter what those freaky little voices in your head say you really shouldn't try to kill me and really should go back on your meds. Parents: The links and/or pages within this website may contain imagery of the Gothic lifestyle you don't want your children seeing. It is guaranteed that some of the following links and/or pages lead to places that have profane language. Please be responsible and supervise children under the age of 16 while they are navigating my site. I try to keep my site clean, but I take no responsibility for anything you may find too ojectionable for your child. It's your job as parents to check sites like mine out before you allow your children on them. Need to email me? Click the button to send it! Please Read Our Terms and Conditions Page before emailing Melvin for your protection and to ensure your email gets read and replied to as soon as possible! HELP OUT YOUR LOCAL HOMELESS ANIMALS!